We have reviewed the project's progress as of February 2019 and would like to note that the progress of the project is difficult to track and very unclear, the current documentation is deleted from the website. The team does not share detailed updates with community. In addition to that, the project is supposed to be affiliated with financial pyramid and is behind its roadmap. Therefore, the project's rating has been decreased to Negative. Worldcore is a Czech fintech project, licensed and regulated by the Czech National Bank. With its ICO, the company is attracting funds for the development and scaling of its services and further expansion into the brokerage and banking services market. Currently, Worldcore does not have a banking license or membership in world payment systems - all this is planned after the ICO. Worldcore’s turnover as of 2016 is not high; however, the team assures that financial indicators show a significant increase in 2017. Nevertheless, from our point of view, the hard cap is overstated, as a result of which it will not be possible to create unsatisfied token demand, which means that demand in the secondary market will not be high at least in the first months after placement. 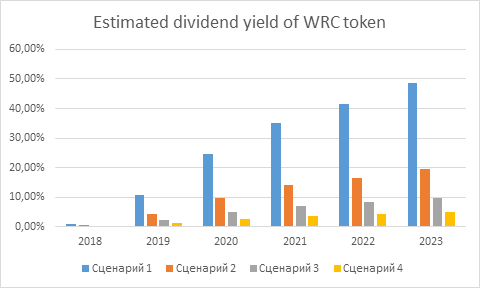 The WRC Token assumes payment of an annual dividend at the rate of 30% of net profit. This can create an obstacle to listing tokens on the top exchanges. This risk must be borne in mind when deciding to participate in the Worldcore crowdsale. However it should be noted that currently, a set of measures is being implemented to give the token a utility functionality, which will reduce risks in a Howey test. In addition, a massive information attack in the English and Russian-speaking community was deployed around Worldcore. We did not find information confirming the truthfulness of the arguments cited by opponents of Worldcore. Moreover, the team gave fairly detailed answers to all our questions. However we are forced to state that a negative external information background can adversely affect WRC token demand during the ICO. The company has a technological approach: in particular, it claims the use of biometric technologies for authorization. The ICO is being implemented for the further development of existing services, their transfer to the blockchain system and the development of services for cryptocurrencies. Accepted payment: BTC, ETH, credit card USD, credit card EUR and a few dozens of cryptocurrency. The list is published on the ICO website in the "Buy Tokens" section. The company does not disclose the proportion of funds raised, but it is known that all funds will be spent on project development in accordance with the roadmap, including the acquisition of membership in payment systems, obtaining licenses, development, legal administrative and corporate expenses. Worldcore claims the position of an international multifunctional financial service for solving any problems both for individuals and for businesses. Particular advantages include a 24-hour service and the shortest possible processing time for applications for opening an account. Let us consider the current services provided. A traditional multi-currency payment account, which has bank account functionality. It features high security, including biometric and sms authentication, as well as a clear interface, transparency and a low level of commission charges, including special conditions for business clients with a monthly turnover of 500,000 Euro. 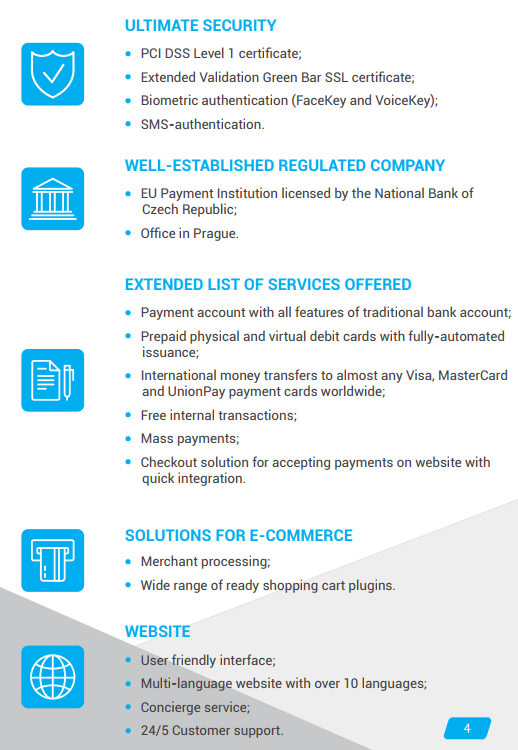 The payment services provided by Worldcore are regulated by the Czech National Bank. All account operations are entirely electronic. Worldcore predicts turnover within the system at $150 million in 2017. Issuance of own debit cards, including virtual. The high manufacturing and delivery costs (about 90 Euro) can be cited as main features in comparison with fiat competitors. Worldcore has withdrawal limits: the daily limit for withdrawal is 4000 euros; monthly limit is 120,000 euros. Worldcore also offers virtual debit cards that provide the ability to implement secure multi-currency transactions. Mass payments to any bank accounts and Visa / MasterCard / ChinaUnionPay cards without restrictions on transactions. The emphasis was placed on the convenience of salary solutions for companies whose employees are dispersed throughout the globe. An API for automation of payments and online purchases - allowing full account control and automation of all processes. PayAnyCard service for sending cryptocurrency to any Visa / Mastercard without registration or restriction on number of transactions. The company itself already accepts payments in Bitcoin via BitPay. Arrangements for payments via the Worldcore website for entrepreneurs with a large selection of payment methods, incl. cryptocurrency. Separately we should pay attention to the so-called "affiliate program" - a service that enables earning 15% of company revenue for an attracted customer, to 20% for a corporate client, spreading information about Worldcore on social media, forums, etc. This service is part of a large-scale advertising company. Summing up the description of products, it can be said that Worldcore is striving to become the leader of the European Fintech market for innovative companies with a rich selection of products and services, main features of which are quality, transparency and convenience for end users. However, only time will tell if the company will manage to implement those ambitious plans. Having launched the ICO, which aims among other things to integrate successful payment solutions of the company into the economy, the company has set a goal to create a completely digital ecosystem, making blockchain asset trade possible (the official website has announced the launch of the Worldcore.TRADE crypto exchange in the first quarter of 2018. ); also P2P loan and international money transfer systems, with the ability to convert cryptocurrency into cash and back at cash points, including Worldcore offices. It should be noted that the project’s concept does not carry innovative ideas for the blockchain sector. Moreover, the stated limit of $100 million might be more expected for transfer to a Swiss bank, for football team sponsorship or launch of a digital media channel, than for development of company products or innovations in electronic payment systems. The transfer of services to blockchain is estimated in much more modest investments by many experts. To promote the ICO, the website has launched a bounty program; participants as usual receive various bonuses performing various tasks to spread information about the project on social media such as Facebook and others. The potential for expanding the target audience for the Worldcore project is huge. Over the past 10 years, the market for electronic payment systems has been actively developing and showing growth dynamics; despite the fact that in the field of international money transfers, companies such as MoneyGram and Western Union as well as banks and postal offices still dominate. However, the high cost of their services motivates consumers to pay attention to faster, simpler and cheaper alternatives, of which Worldcore is one. According to the World bank’s research, volume for the money transfer market is almost $600 billion. Electronic players claim a considerable share of this market, using the latest technology, aggressive marketing and a low cost for services. In contrast, traditional operators have an advantage in the form of mature client bases, a widespread network of offices worldwide, especially in developing countries; they are leaders in terms of received remittances and high level of brand awareness. For comparison, Western Union declared a volume of remittances to the amount of $74 billion in 2015, while the largest online service, TransferWise reported a turnover of less than $15 billion. Compared to such large players Worldcore resembles a start-up so far. Worldcore’s market share is minimal. Nevertheless, the market itself is huge, and its growth rate is very dynamic. Taking into account the growth of the electronic money transfer market, and the annually increasing volume for cross-border transfers of funds, the company can claim to increase its market share with the proper management and implementation of innovative technologies, especially in the blockchain sector. Despite the fact that Worldcore positions itself as a Czech payment institution with an office in Prague, the team is mainly Russian-speaking. - Alexey Nasonov (linkedin) - Founder and CEO of the company. Mentioned in Financial Times article "New Europe 100 - changemakers in Central and Eastern Europe". Various sources state his 8-year experience in trading on exchanges and developing start-ups. - Sean Patterson (linkedin) - Marketing director. Apple, TetraPak and Porsche are listed as previous employers; Sean also has an MBA. - Igor Prokhorenko (linkedin) - Technical director. Igor’s LinkedIn profile does not contain information about work experience or recommendations. The company claims that there are 40 people on the staff. According to the ICO documentation, the company not only has sufficient staff, but also an impressive list of partners. In addition, the company has consultants but does not name them. All this information is backed up by very little evidence. About half of the employees in their LinkedIn profiles do not indicate Worldcore as their place of work; there are no references to cooperation with Worldcore on partner websites. When studying the information about the project team it is especially important that there is no possibility of confirming the team’s experience in cryptocurrency or blockchain. Membership of JCB and American Express. This we consider the main stage: Geographical expansion in European countries and acquisition of membership in payment systems for the development of Worldcore’s business are fundamental. The launch of a blockchain credit platform in the event of success will ensure synergy with the core business of Worldcore, which is clearly positive for the project. International marketing campaigns at events and in open air for all products in most European countries. WorldcoreTV is very capital-intensive, but ambiguous from the point of view of further monetization. The platform for converting cryptocurrency, in turn, will already face strong competition by 2019: this segment will be quickly saturated. Sponsorship of world-renowned sports teams in football, hockey and racing championships in order to maximize brand awareness with further profit growth. Creation of special and unique conditions for all ICO participants. Transfer to a Swiss bank looks like marketingspeak. For Worldcore’s business it is inexpedient and unprofitable. On the contrary, a less well-known jurisdiction will allow the same operations to be conducted more cheaply. Sponsorship is also a controversial decision from the point of view of the ICO. Sponsoring sports teams at the expense of the means of backers, in our understanding, is not best practice. All funds exceeding $50 million will be used for further development of the market, added to the potential bank capital of Worldcore and used for further IPO. We were concerned about the announcement of an IPO in this context. We believe that an IPO after an ICO creates a conflict of interest between shareholders and tokenholders. The team assured us that there are no plans to stage an IPO in current regulatory and legal realities; in the event that the situation changes the decision will be taken by tokenholder vote. The Worldcore team is really well prepared for the ICO – there is lots of advertising on the internet; the website is replete with marketing and advertising sales points. The same can be said about the white paper, in which among other things slogans and beautiful phrases are plentiful. This does not chime with the standards established in the ICO-sphere, which presuppose a more rigorous and conservative approach to the clear presentation of information. Worldcore has unfortunately faced serious problems during the marketing of its ICO. The project has faced a real information attack both on Russian-speaking and English-speaking segments of the internet. The result of the information attack has been 55 pages’ worth of disputes on the Russian-language Bitcointalk thread and the closure of the English-language thread. The project was repeatedly accused of being a scam. We researched but did not find any information confirming the truthfulness of arguments cited by opponents of Worldcore. Moreover, the team gave fairly detailed answers to all our questions. Nevertheless, we recommend carefully analyzing the information provided on the internet and giving a personal estimate before deciding whether to deal with WRC tokens. Despite the lack of objective evidence, we are forced to state that such a controversial external information background can negatively affect the demand for WRC tokens during the ICO. We see the main advantage of Worldcore as security in the use of its services, including via unique voice biometric authentication. The security of company operations is confirmed by 1st level PCI DSS certificate. Strong points also include a user-friendly interface and website translation into 10 languages. Services for the conversion of cryptocurrency are not provided by all market players. Considering the Worldcore project as a payment service in the blockchain sector, its advantage includes experience with BitPay. Given that the cryptocurrency market is young and growing with due development, Worldcore can become a serious competitor to most services as its product line is extensive. Mass payment providers: Skrill Payouts (low fees, unlimited number of recipients and large choice of currencies), OKPAY (this company offers its own API that enables sending mass payments), Dwolla MassPay (transfer to up to 5000 people at once is available. Payments are made by simply downloading a file to the system). Online payment processing service: Western Union (very strong and well-known player whose key advantages are reliability, accessibility and reputation; in this context it is an online FX service), PayPal (a well-known financial institution that enables transfers from an account on a website, a plastic card or a bank account), TransferWise (a company operating on a P2P platform that supports more than 500 currencies. Its commission seems understated in comparison to competitors). Many organizations provide a service for transferring cryptocurrency to cards. Here we can note American Shift’s service which has a lot of advantages, such as low cost of issue, free domestic transactions, a convenient mobile application, a Bitpay card with high limits, and a high speed for transfers and technical support work. Information about the fees charged by the service is available on the website: https://worldcore.eu/Public/Fees. Domestic money transfers within Worldcore are free. There are no charges for opening and maintaining an account. In addition, a Worldcore account can be replenished free from a bank account. The fee for transfers is 0.75%. The maximum commission is 90 euros, the minimum is 40 euros. Express transfer is more expensive: from 60 to 100 euros. A Worldcore plastic card costs 20 euros; the transaction fee at an ATM is 2.25 euros. In 2017, Worldcore predicts a turnover of $150 million (about 130 million euros). 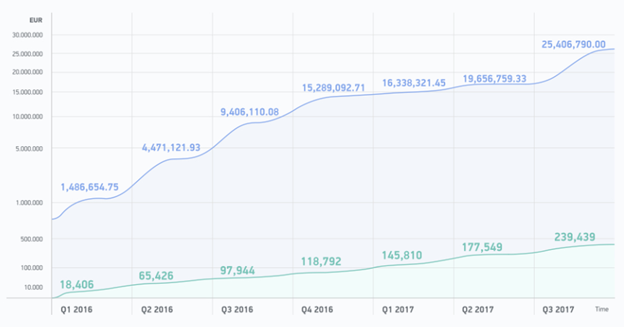 This forecast, from our point of view, is too optimistic: it obviously does not correlate with the figures given in the chart; to achieve it, it is necessary to place 70 million euros in circulation on the Worldcore platform in the 4th quarter, which is almost three times more than in the third quarter. The numbers on the chart are not audited. However, we were able to compare them with the official reporting for EUPSProvider s.r.o, available in Czech on the website of the Ministry of Justice of the Czech Republic. According to the report, the company's revenue in 2016 amounted to 8.24 million CZK (equivalent to 305,000 euros). Thus, the revenue schedule for 2016, presented on the ICO website, roughly corresponds to the figures in Czech accounts. The average commission with turnover is 0.9% in the 2017 calendar year. Assuming that in the 4th quarter the average commission rate will not change, we come to the conclusion that with a declared annual turnover of $150 million, revenue may amount about $1.35 million. Worldcore claims that the team already has more than 40 people. The cost of personnel due to the revenue calculated by us cannot be covered. Therefore, it is obvious that a significant share of costs will be financed by the funds raised during the ICO. Theoretically, the more funds attracted during the ICO, the smaller will be the economic risk for tokenholders. The report is available for downloading on the Worldcore ICO website after provision of personal data. 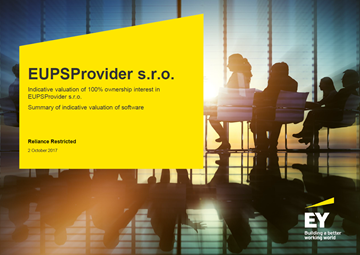 The business value of EUPSProvider s.r.o. is estimated by E & Y at 16-22 million euro, assuming lower case and 18-26 million euro assuming upper case. Estimates are obtained by the method of discounting cash flows (DCF). The range of estimates is formed due to differences in the applied discount rate - from 30 to 40%. Average commission rate: 1.25% in 2017-2018, 1.0% in 2019-2022. Interest income on free balances of client funds: 1% per annum. Thus, it is obvious that the forecasts about CAGR are quite optimistic; also that the expected rate of commission income exceeds the current rate. And most importantly, even taking into account optimistic assumptions underlying the financial model, E & Y estimates the cost of Worldcore’s business at about four times less than the determined hard cap. This should be borne in mind when deciding whether to deal with WRC tokens. We have discussed economic risks, and risks associated with the poor reputation of the project in the community, mainly the Russian-speaking one. We believe that funds for the ICO would have been greater, but for the information attack which the project encountered. We also cite the roadmap, which contains some questionable logic, as a risk of the project: in our understanding the sponsorship of sports teams, the Swiss bank and the IPO - all these are superfluous for Worldcore; the rationale for these projects is questionable, and their feasibility of implementation is under even greater question. We did not manage to check the feasibility of the turnover schedule for 2017. At the same time, we should note that there are very few reviews and comments on the internet regarding Worldcore’s services. In conclusion we may say that information about the team, which lacks evidence to back it up, can be cited as a risk. About half of the employees do not indicate Worldcore as a place of work on their LinkedIn profiles; there are no references to cooperation with Worldcore on partner websites. The main motivation to buy a WRC token is to receive a dividend at the rate of 30% of the company's net profit. Such a token will probably not pass the Howey test and will not be admitted to listing on the largest crypto exchanges, which will negatively affect its liquidity and profitability in the secondary market. Discounts for Worldcore payment services at Worldcore.eu (ordering of a debit card, transactions, bank transfers). Voting rights for key marketing, management and expansion decisions. Token holders who actively participate in Worldcore’s business and token promotion have the right to a revenue share on March 31st every year. Revenue share is calculated in proportion of owned tokens compared to the total supply. Revenue share is credited after submission and review of an annual report uploaded by token holder at our special interface for token holders. The report has to include at least 5 points of what has been done to make Worldcore and the WRC token more popular. WRC tokens will also be used as gas for the upcoming blockchain payment platform of Worldcore. We emphasize that at the time of publication of the review, this information was not presented in the documentation for Worldcore’s ICO. Let us return to the investment attractiveness of the token. The team does not disclose data on net profit, which will be used as a basis for calculating the dividend. The E & Y report also does not include net profit forecasts, only NOPAT. USD / CZK rate will be stable and correspond to the exchange rate at the date of writing the review (21,94). Scenario 1: $10 million raised during the crowdsale. Scenario 2: $25 million raised during the crowdsale. Scenario 3: $50 million raised during the crowdsale. Scenario 4: $100 million raised during the crowdsale. The smaller the amount attracted by the ICO, the higher the dividend yield, since the amount of payments is divided into fewer coins. However, we do not know the dependence of CAGR of the Worldcore platform turnover on the success of the ICO. Most likely, the less Worldcore attracts, the longer the process of capturing the market takes; the turnover and profit would grow more slowly. Taking into account these aforementioned factors, we do not assign a rating to the investment attractiveness of WRC tokens. Transactions with WRC tokens should be made only if the investor is aware of the risks identified in this review. The information contained in the document is for informational purposes only. ICORating received monetary compensation in the amount of $13000 from the entity rated in this report for completing the ratings report. However, the entity rated in this report did not have the opportunity to approve this rating report before the report was published, nor did the rated entity have the opportunity to edit or remove this report once it was published. The views expressed in this document are solely those of the ICORating Team, based on data obtained from open access and information that developers provided to the team through Skype, email or other means of communication. Our goal is to increase the transparency and reliability of the young ICO market and to minimize the risk of fraud. We appreciate feedback with constructive comments, suggestions and ideas on how to make the analysis more comprehensive and informative.